…to the 2017 Annual Report which details the overall performance of RID from July 1, 2016 to June 30, 2017 making it FY2017. Please Note: This is a large, comprehensive, multi-media report, which includes text, video, and images. It may take a few minutes to fully load into your browser. s the story of an organization comprised largely of volunteer leaders and a small team of professional staff who worked diligently to address the systemic causes that led to crisis. Ultimately, this is the story of Deaf and hearing individuals who share a common vision and choose to work shoulder-to-shoulder, even in difficult times, to ensure that the right of Deaf individuals to linguistic access is preserved through the provision of qualified interpreting services by certified practitioners. 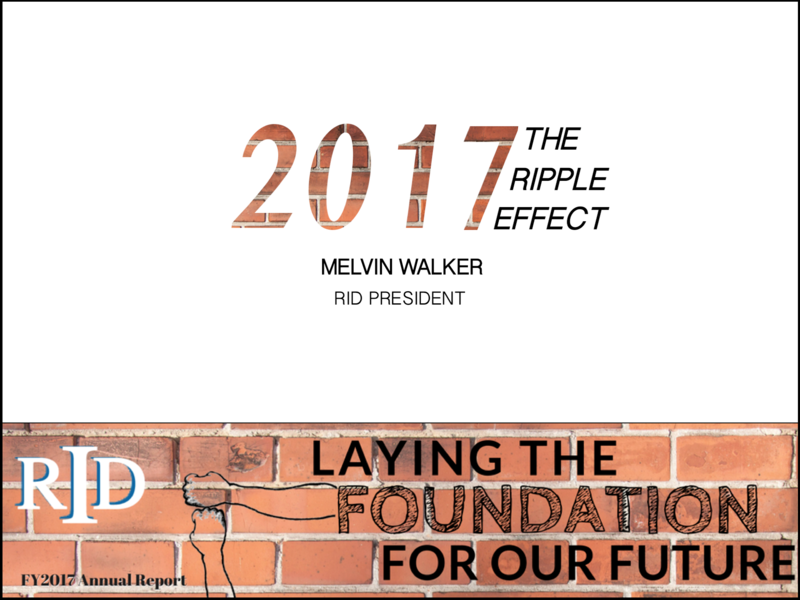 When I reflect on FY17, I think of a quote by the Dalai Lama: “Just as ripples spread out when a pebble is dropped into water, the actions of individuals can have far-reaching effects.” FY17 was marked by the continuing ripple effects associated with decisions and actions made by individuals in many different volunteer leadership and staff roles at RID. Some of the ripples marked progress, renewal and change. Some of the ripples served as reminders of the work that remains before us. As Board President, I am inspired by the dedication and commitment of many outstanding individuals who helped us turn a new leaf following a difficult period in our organizational history. On behalf of the association, I extend deep appreciation to each and every volunteer leader at the local, regional, and national level of RID, and to the small but dedicated staff at Headquarters. The contributions of each of these individuals make possible the transition from a period of significant crisis to one of renewal and stability. In FY17, the Board of Directors met eleven times—nine of the meetings were online and two were face-to-face. The face-to-face meetings occurred in Alexandria, Virginia in December 2016 and in Salt Lake City in March 2017. The minutes of the meetings are posted on the RID website for review by members and stakeholders. http://rid.org/about-rid/governance/board-meeting-agenda/. FY17, which covers the period of July 1, 2016 – June 30, 2017, marks the year that RID set in motion its commitment to change by separating knowledge, ethics, and performance testing from its core operations. RID established a subsidiary—the Center for the Assessment of SIgn Language Interpretation (CASLI)—responsible for administering all knowledge, ethics, and performance exams and developing and maintaining new generalist tests for Deaf and hearing practitioners. 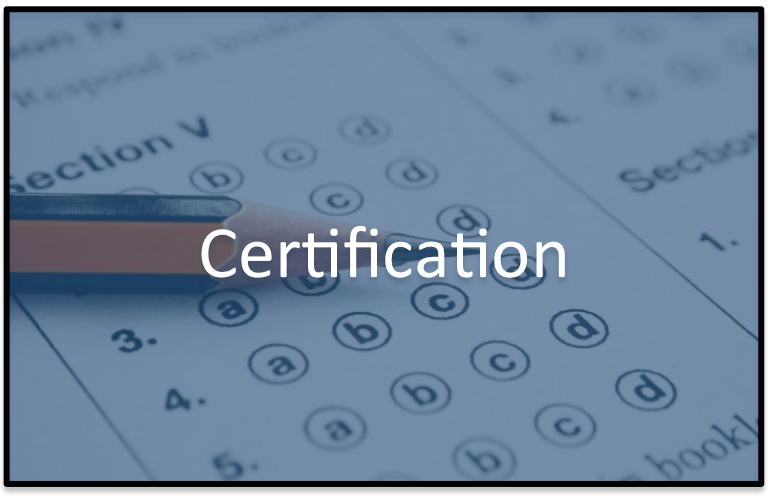 RID remains the certifying body for organizational members and will continue to set the standards for certification and certification maintenance, but the related testing functions are now the responsibility of CASLI. This change required an investment of funds to assist with the development of new generalist tests, along with the transfer of testing income from RID to CASLI. 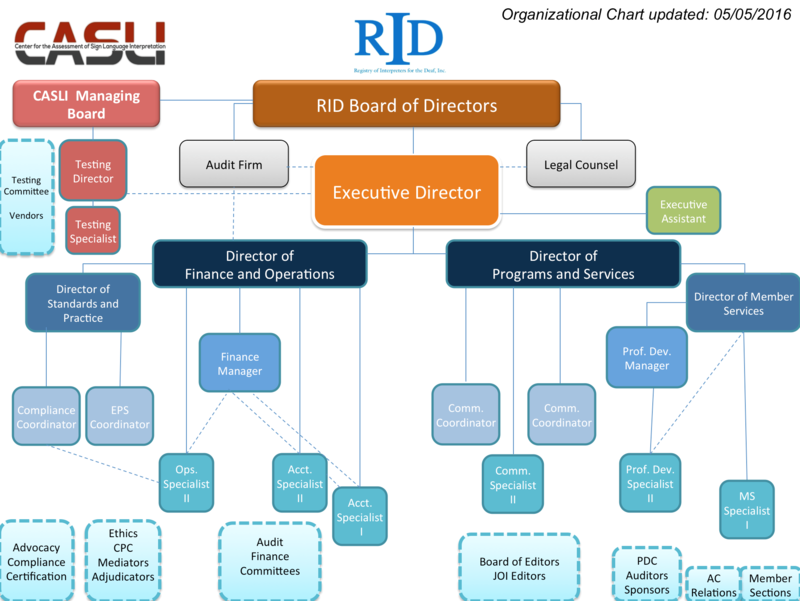 This change also required the availability of the RID Board of Directors to work collaboratively with the managing board of CASLI in order to separate duties and responsibilities and lay out a plan of action for the governance and operations of CASLI. We are all invested in CASLI’s success. This change paves the way for more autonomous test development and administration that may eventually include other stakeholder organizations. It also sets in motion a fiscal plan for test development and maintenance that does not absorb costs for general operations or other programs under RID’s purview . Also during FY17, the Board continued its search for an Executive Director. This became essential given Anna Witter-Merithew’s notice of retirement from her role as Interim Executive Director in the summer. Unfortunately, the right candidate has not yet surfaced but will be a top priority for FY18. This period of change and recovery at RID has clarified the type of executive leadership the organization needs. The Board is optimistic that FY18 will result in a successful hiring. FY17 also marked a change in the approach to conferencing. Growing evidence suggested that although national conferences were popular with many members, they were not affordable for most members and conference turnout did not represent the substantive diversity of the membership. Additionally, business meetings were poorly attended during conference despite adequate registration numbers. With the losses RID experienced over the past decade of conferences, an alternative approach was sought. The Board began meeting quarterly with volunteer leaders from Affiliate Chapters, Member Sections, Councils, and Committees during FY16 and continued this important collaboration in FY17. From these quarterly webinars, the Board learned of a growing desire and need for volunteer leadership training, due to growing concerns about systemic barriers that limit the participation of marginalized and diverse members in RID. Organizational assessments highlighted the members desire to have greater inclusion of diverse perspectives in organizational and governance issues. To that end, FY17 prioritized the creation of a conference plan that would allow us to address leadership development around core organizational issues, including a serious look at systemic power, privilege, and oppression. It was also critical to engage novice interpreters seeking certification. Ultimately, two conference tracks were set—a leadership track and a skills track. The conference registration process was challenging. Due to cost restraints, the number of individuals who could attend conference was limited, which was unpopular with many members. The goal of ensuring inclusion of more marginalized and diverse representatives of RID was received as exclusion by the majority. This was an unfortunate and unintended consequence from which we learned important lessons. However, the lottery system used to reserve half of the limited slots for diverse representation from member sections, committees, councils, and affiliate chapters was successful in creating more diverse attendance. Finding a creative solution for diverse representation and cost-effectiveness at future conferences remains an important priority. The 2017 National Conference was actually held in the early weeks of FY18 and so the outcomes of the conference will be reported in the FY18 Annual Report. yourself with as much of the information as possible. It serves as one of the most important forms of transparency between the organization and its members and stakeholders. 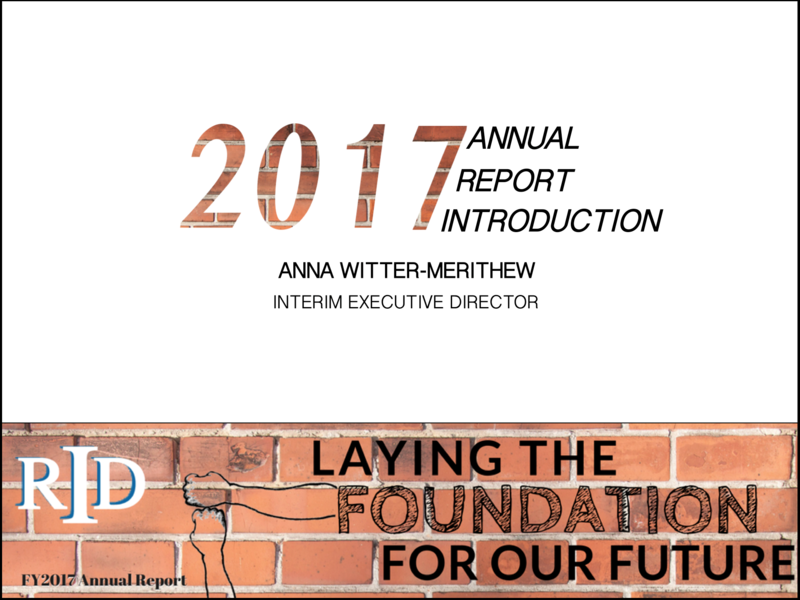 The Annual Report, along with RID’s other publications such as the quarterly VIEWS, monthly e-News, and the minutes of Board meetings, provide the members with a strong picture of what is happening within RID and the rationale behind decisions that are being made. Your feedback is invited and welcomed. Greetings! Welcome to the FY17 Annual Report, which addresses the business of RID between July 1, 2016-June 30, 2017. 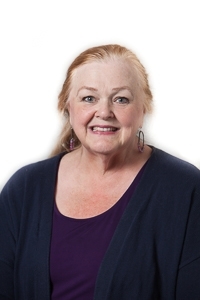 My name is Anna Witter-Merithew, RID Interim Executive Director during the period of March 26, 2015 – August 5, 2017. Central to every spending decision made within the RID Headquarters is the simple but powerful idea that we must budget and spend according to our actual, versus desired, resources. 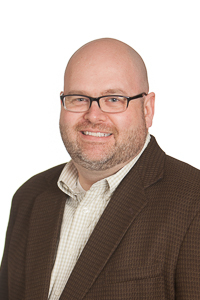 Rather than continuing with ideas and strategies which led to a decade of consistent losses in key services such as testing, certification, and conferencing, RID is focused on creating a solid fiscal foundation for FY17 and beyond, and conducting business in a manner that will allow us to thrive, and to avoid a repeat of the financial and organizational crisis of recent years. It has been two years since the Board of Directors’ decision to shift the RID business model in order to improve overall sustainability of the organization. The decision resulted in two significant changes. The first change is in how we approach the budgeting process and the management of our finances: we changed from a decade-old model of deficit-spending to zero-based budgeting. The second change is in how the testing functions are operationalized and managed. As of July 1, 2016, the test development, maintenance, and delivery functions of RID are managed and administered through its subsidiary LLC, the Center for the Assessment of Sign Language Interpretation (CASLI). Making these two changes required the foresight to recognize prior finance and business strategies that were ill-suited for sustainability, and the discipline to enact fundamental shifts in organizational culture. Many contributed to the shift, but I’d like to acknowledge a few key individuals. First, thank you to the Board of Directors, who approved the annual budget and provided oversight. They had the courage to mandate these changes in the face of resistance from some members and stakeholders. Thank you also to Elijah Sow, Senior Director of Operations and Finance, and Jennifer Apple, Finance Administrator—these members of the Headquarters team were responsible for the day-to-day administration and management of the association’s finances. They ensured that we spent what we could afford versus what we desired or hoped to earn. These individuals have been responsible stewards of the association’s limited resources and they are the reason we are moving forward towards a strong renewal and recovery. As I look back on FY17, I am proud to report that RID is building a strong foundation for the future—one that will enable us to achieve stability and sustainability in testing, support RID’s certification system, and succeed in our core mission over the next decade. Here are a number of highlights from this annual report that demonstrate this strengthened foundation. –CASLI launched operations on July 1, 2016, having recruited three of five members of the managing board, who were vetted and appointed by the RID Board of Directors. All five members were appointed by the end of 2016. The five members represent the disciplines of linguistics, ASL, interpreting, education, research, business, and finance. –A contract was operationalized with a new test site vendor, Comira, expanding test sites by more than four times the number available prior to the moratorium placed on the NIC Performance Exam. –Scheduling resumed for the NIC Interview and Performance Exam on October 1, 2016 and candidates started actively testing on November 1, 2016. –Uploading candidate performance samples from the test site initiated, allowing for more prompt rating of the NIC Interview and Performance Exam and eliminating a variety of other operational deficiencies. This ultimately reduces the wait time on rating results. 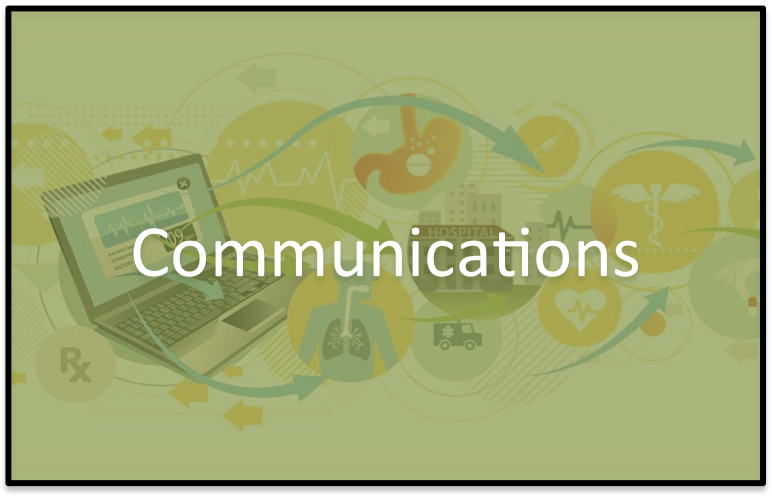 –Headquarters compiled an online library of testing and certification-related communications available in both ASL and English that address the August 2015 moratorium placed on the NIC Performance Exam, the 2015-2016 Testing and Certification Risk Assessment, Frequently Asked Questions, and other related posts. The library can be accessed by members and stakeholders at the following link: http://rid.org/category/cc-library/. –Zero-based budgeting and active financial management improved RID’s year-over-year performance trend, which can be seen in the changing net assets. In FY15 the change in net assets was a deficit of ($232,579). In FY16 there was a modest recovery and the change in net assets was $48,893. In FY17 the recovery continued and the change in net assets was $189,369. In addition, CASLI’s change in net assets after one year in operation was $355,770. This includes the $110,000 that RID invested in CASLI in FY17 to help cover the cost of new test development. CASLI’s net assets will be used to defray the cost of new test development and maintenance. –RID was able to pay back approximately $200,000 in reserve funds used in FY15 and FY16 and left those funds untapped in FY17, helping regain financial stability for the organization. These successes were achieved by making cuts in operational costs such as reducing Board and staff travel, freezing vacant positions temporarily, outsourcing certain operational functions, and applying other cost-effective measures. RID will continue to respond to fiscal and operational demands in a similarly responsible manner so that a complete recovery from the fiscal crisis of FY14-FY15 can be achieved. Another important achievement of FY17 was the foundation laid for greater member engagement. RID organized and promoted a leadership training track for the 2017 (FY18) National Conference and reserved slots for volunteer leaders from Affiliate Chapters, Member Sections, Councils, and Committees. RID also awarded registration packages covering airfare, hotel, and registration for ten members representing identity-based member sections (DC, ITOC, BLeGIT*, DPI) and regional selections. Fifty small group facilitators were trained to support the work of members at the conference. The specific outcomes of the conference will be reported in the FY18 Annual Report. istic rights of Deaf individuals and motivates the work of volunteer leaders throughout RID and its affiliates, as well as the HQ staff. Thank you! The Board of Directors is a member-elected body composed of RID certified professional interpreters. The role of the board is to govern the organization by setting the direction and vision through internal and external stakeholder engagement. 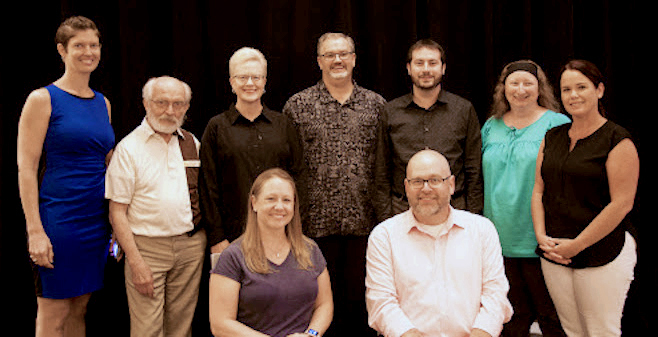 The 11 member board is comprised of the executive board (president, vice-president, secretary, treasurer, member-at-large, deaf member-at-large) and 5 regional representatives. The executive board is nominated and elected at the national biennial conference during odd-numbered years. In addition, the 5 regional representatives are nominated and elected during the regional biennial conferences on even-numbered years. The length of service for all board members is two years. The Registry of Interpreters for the Deaf strives to advocate for best practices in interpreting, professional development for practitioners and for the highest standards in the provision of interpreting services for diverse users of languages that are signed or spoken. 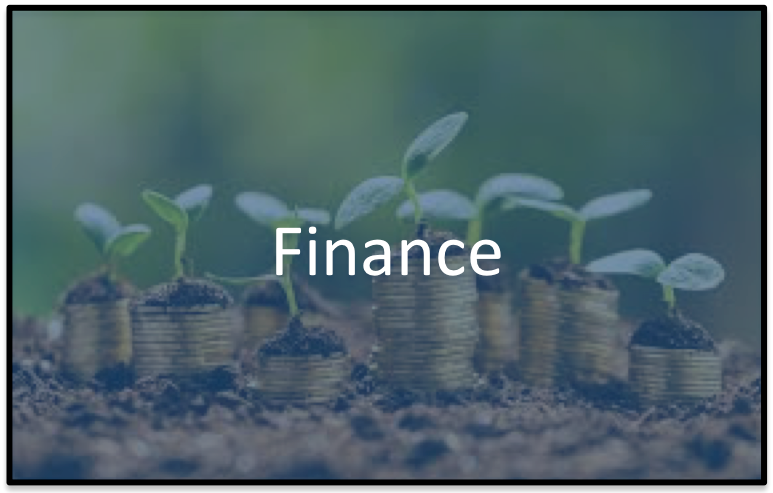 The Division of Finance and Operations is responsible for the Finance and Accounting, Operations, Human Resources, and Standard and Practices departments within the association. The Finance and Accounting department is charged with properly accounting and reporting on all funds that are deposited and disbursed on behalf of RID. The duties include budget formulation and execution, accounts receivable, accounts payable, employee payroll, and centralized purchasing. The department’s goals are to modernize the association’s financial systems in order to provide online, real-time transaction capability, provide reporting of financial data as directed by the Board of Directors, and maintain accounting records that are accurate and up-to-date. The Operations department is responsible for the safe, efficient, and effective daily operations and maintenance of the RID facility and grounds. Also, the department is in charge of planning, design, construction, and renovation of the ­headquarters building located in Alexandria, Virginia. In addition, the Human Resources department provides the organization with the structure and ability to fulfill the association’s mission by recruiting, developing, and retaining our most valuable resources–the employees! 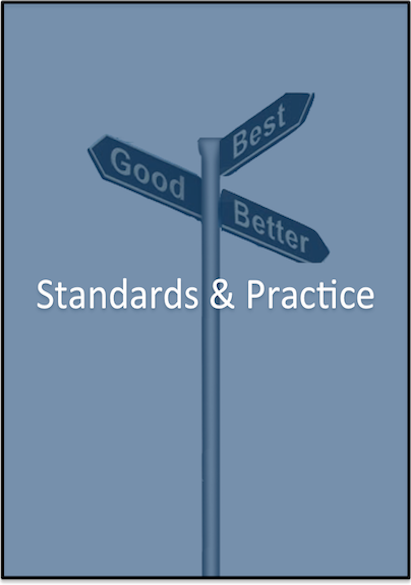 Lastly, the division includes the management and oversight of the Standards and Practices department which administers the Government Affairs Program (GAP), compliance, certification, and Ethical Practice Systems (EPS) programs. 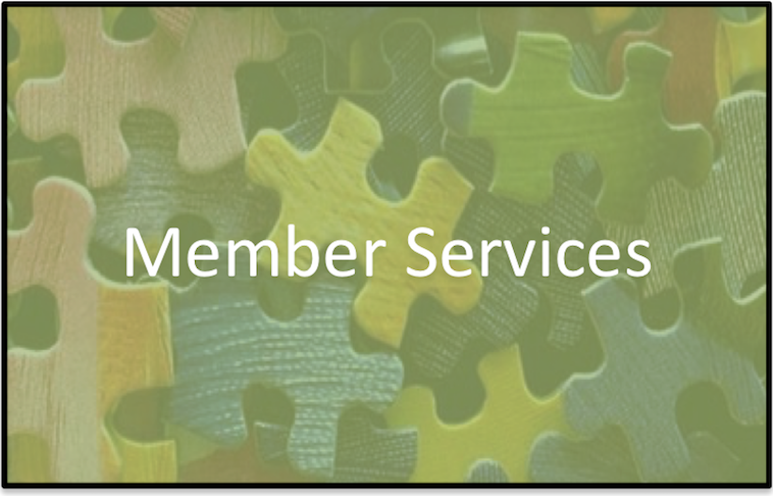 The Division of Programs and Services is responsible for providing member services, professional development, and communications to RID stakeholders. The Member Services department maintains the database for the registry of interpreters, offers customer service assistance to the membership and to the public, and supports the volunteer leadership governance structure. 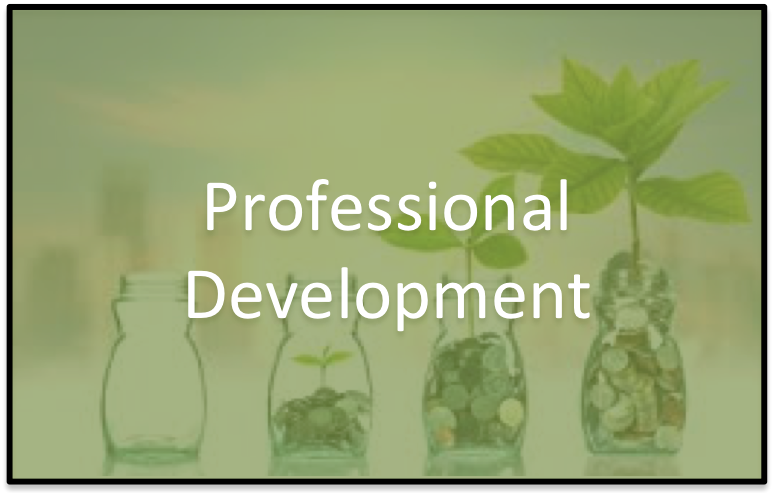 Professional development is responsible for continuing education of members and approval of sponsors. 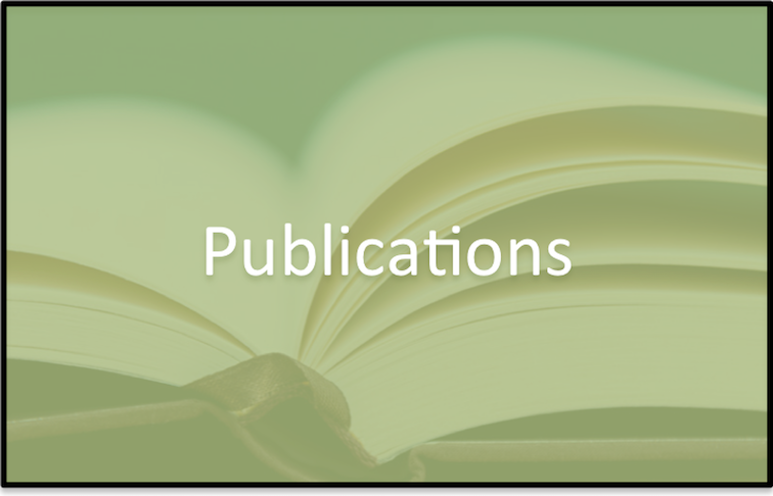 The Communications department is responsible for the annual publication of the Journal of Interpretation and the Annual Report, quarterly publication of the VIEWS, monthly E-news, periodic press releases, social media, and the publishing of books relevant to the fields of interpreting and interpreter education.